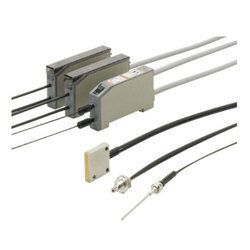 Reliable, accurate and durable sensor elements are key to success for a variety of applications. In order to be successful, you need a partner with proven technical expertise and manufacturing expertise, that can provide exactly the right solution for your business and your application. MS-HLAC1-1-Use when mounting the controller with screws. sensing range than conventional models! select, they are all easy to use. The M18-L series offers all optical functions in an M18 hous-ing. The visible laser light spot makes the sensor simple to align. 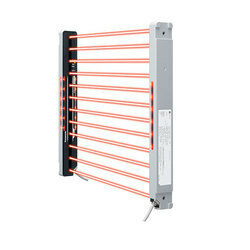 It is easy to install and requires little space due to its ultra-compact size. The Panasonic Sunx Laser Sensors, standard 50x50x15mm compact housing, offers all the most advanced optic functions, as well as the universal, available with safety class 1 laser emission. This series offers versions with cable or M12 connection that can be rotated for either straight or right-angle positions. All versions have NPN or PNP output and standard confi guration conforming to the EN 60947-5-2 standard. There are 16 types of LC100 available. 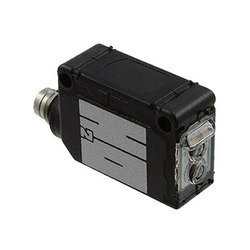 The LC120 series, developed in the 50x50x18mm compact plastic housing, offers the maximum performance of optic detection functions for industrial automation. 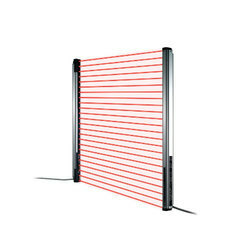 Furthermore, versions with visible red laser emission are available with 5–35cm background suppression and polarized retroreflex reaching more than 20m. 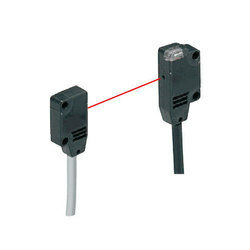 These laser sensors are characterized by a very small light spot as well as a low response time that guarantee excellent detection repeatability, even of very small objects or movements. 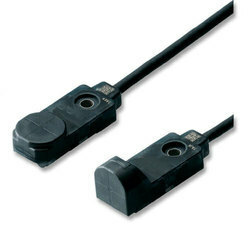 They are approximately the same size as general purpose photoelectric sensors, and the mounting method is identical. The Panasonic Sunx Pressure / Flow Sensors DP-2 of pressure/vacuum sensors offers a high resolution, high-speed, and high-accuracy solution for all of your pressure sensing needs. A 2.5ms response time is achieved with excellent repeatability and temperature characteristics. A 10mm red LED display allows for good visibility in bright and dim ambient conditions. Simple key setup allows for quick initialization and threshold value settings. 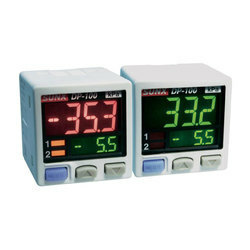 The display can be changed between six pressure units, allowing flexibility in many applications. The DP2 series incorporates 2 comparative outputs (NPN or PNP) as well as one analog output. GP-X INDUCTIVE (CONTROLLER) The inductive displacement transducers of the GP-X series use eddy current techniques and are particularly noted for their highly accurate measurement at a resolution of 0.02% F.S. with minimal linearity error, a high sampling frequency of 40kHz and low temperature dependence. GP-X sensors are ideally suitable for the highly accurate motion and distance control of metal objects in harsh industrial environments. LM10. Measuring sensors. 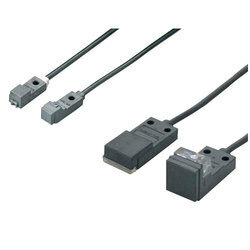 General purpose photoelectric sensors. Type. Standard model. 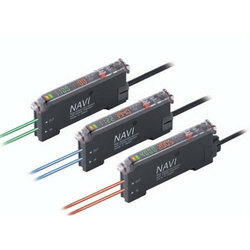 The LA-300 series of LED collimated beam sensors provides a compact, safe alternative to laser diode types. The compact size of the sensor heads allows for versatile placement in your machine. Beam alignment is simplified by incorporating a 3-stage stability indicator along with a target label for accurate positioning of the incident light beam. Two comparative outputs (NPN or PNP) and one analog output (1 to 5V) are integrated for simple configuration. Also, shift and span adjustments of the analog output are possible with the controller. Note:If analog voltage output of LA-A1 or LA-A1P is shifted, the input range may be exceeded. In that case, use CA2-T5 (input range –10 to +10 V). 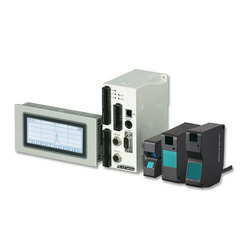 For further details, refer to p.793~ for the ultra-compact digital panel controller CA2 series. The Panasonic Sunx Ultra-compact Laser Sensor high precision performance in an incredibly small form factor. This self-contained laser sensor combines long range detection with a minimum sensing object of a mere 0.3mm for detections that require high accuracy and optimal mounting flexibility. MS-EXL2-2 (Mounting plate for thru-beam type): 1 pc. MS-EXL2-3 (Mounting plate for retroreflective / spot reflective / convergent reflective type): 1 pc. With the Panasonic FZ-10 series, you'll get reliable and precise color discrimination that's easy to set up. The series features RGB LED's, high-speed 1ms response time, excellent color detectability and has four types available to suit your needs. The EX-20 series reaches the pinnacle of sensor miniaturization. By fabricating the photo-diode and the A/D conversion circuit on the same chip, Panasonic (formerly Sunx) has achieved one of the smallest built-in amplifier sensors in the world. With integrated sensitivity adjustment, the EX-20 series is great for use as an all-purpose sensor. Even though the sensor is extremely small, the sensing distance is not compromised. Up to a 2m detection distance is possible with the thru-beam type, 200mm with the retro-reflective type, and 160mm for the diffuse reflective type. A visible red beam spot allows for easy confirmation of alignment. Also, the LED used in the EX-20 series provides a high-power, narrow beam that can produce a spot as small as 1mm in diameter. This is great for the detection of small objects such as chip components or wires. The mounting options available include a front sensing type as well as a side sensing type. Each type has two, metal reinforced M3 mounting holes for stable sensor placement. 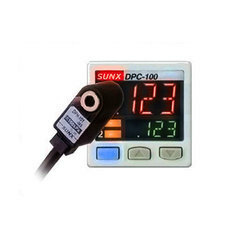 The Sunx EX-10 Photoelectric Sensors is one of the smallest sensors on the market today. The ultra small size allows for mounting in the smallest areas. 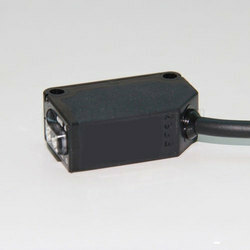 A bright 2-color indicator on the sensor head allows for quick determination of the sensor state. The EX-10 series is also equipped with a 0.5ms response time for high-speed detection and an IP-67 rated housing for wash-down environments. The mounting options available include a front sensing type as well as a side sensing type. Each type has two, metal reinforced M3 mounting holes for stable sensor placement. 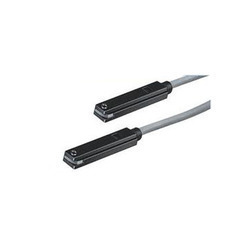 The Sunx EQ-500 Photoelectric Sensors of photoelectric sensors provides a long-range diffuse reflective solution that is suitable for applications where it is not feasible to get close to the sensing object. The sensor is impervious to changes in an object's angle, gloss, or even color, so you get an accurate detection every time. Built in an IP-67 rated enclosure, the EQ-500 series is also good for use in harsh environments. 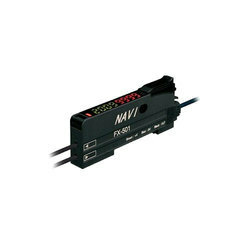 The sensing range is easily adjustable to a maximum of 2.5. All models are also available with a built-in ON or OFF delay timer function. 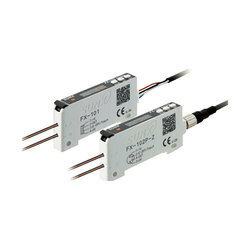 The EQ-30 series photoelectric sensors provide a long-range back ground suppression solution that is suitable for applications where it is not feasible to get close to the sensing object. The sensor is impervious to changes in an object's angle, gloss, or even color, so you get an accurate detection every time. 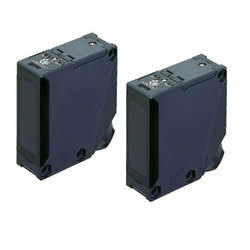 Built in an IP-67 rated enclosure, the series is also good for use in harsh environments. 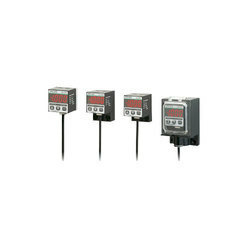 The sensing range is easily adjustable to a maximum of 2 meters. Options include model with 2 outputs for high and low level tank applications. 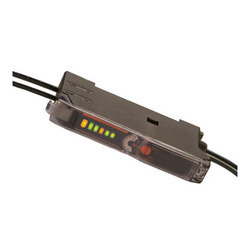 The EX-F70/F60 series of leak detection Photoelectric Sensors offer a unique and reliable method of protecting your equipment against leaks. Using a capillary effect, the sensor utilizes the change in refractive index to detect small leaks and viscous liquids. The built-in amplifier sensor offers a compact design, and is available in general purpose (water detection) and chemical-resistant types. 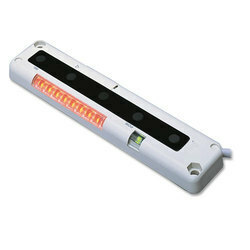 A convenient LED indicator allows for simple verification of fault conditions. There is no need for sensitivity adjustments, and two simple mounting bracket styles facilitate simple installation. 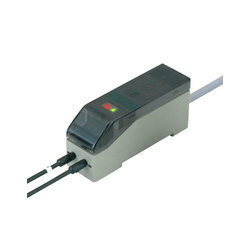 The NA40 series of area sensors offers a simple, cost-effective setup for your wide area detection needs. Its robust yet slim aluminum enclosure allows for easy placement on you machine. A built-in interference prevention function even allows for close mounting of two sets of sensors. 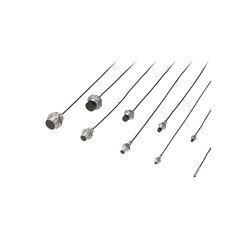 Its modular design enables modification of the number of beam channels and makes design changes or machine maintenance simple; and, because there is no need for a synchronization wire, the sensor wiring operation is simplified. Also, integrated failure monitoring combats false positives due to dust, dirt, or even a failure to the output transistor. 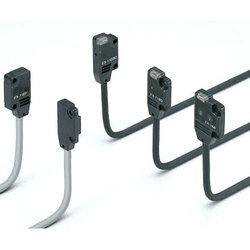 A wide range of sensor heights is available from 120mm to 920mm. 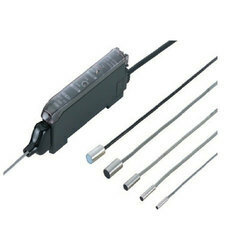 The RX-LS200 series of photoelectric sensors provides a background suppression solution for accurate detection of various targets. The sensor is not affected by dust, color, or background due to the PSD with mechanical lens. The die-cast, zinc alloy, IP67 body provides robust protection against external factors and an optional protective tubing sleeve provides protection for the wiring. Reliable object detection in limited area. Due to convergent distance sensing, the color or material of the object has almost no effect. Further, the background also has very little effect, enabling stable sensing. 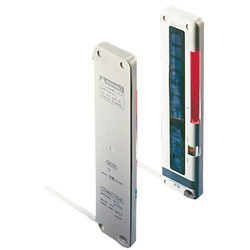 The spot-beam type EX-43T is incorporated with an OFF-delay timer. The variable OFF-delay timer is useful for detecting a printed circuit board regardless of small holes, cutouts or electronic parts on it. 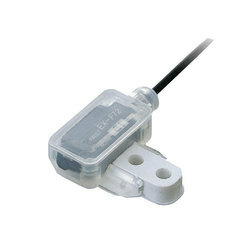 It is usable with the sensor & wire-saving link system S-LINK, sensor block for simple wiring SL-BMW or SL-BW, or with connector attached cable CN-54-C2 or CN-54-C5. 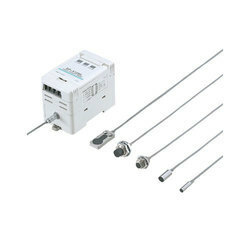 The VF series is a multi-voltage photoelectric sensor with a convenient terminal block that offers quick and easy connection. 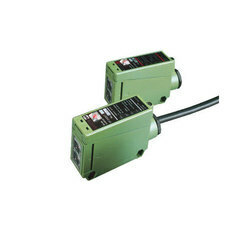 Because of the free-range voltage input, this series can be used with a power supply from 24 to 240 VAC or 12-240VDC. The VF series is characterized by long sensing distances up to 10m and has three available built-in timer functions for simple output control. Three sensing styles are represented by the VF series: diffuse reflective, retro-reflective, and thru-beam. Also, the VF-PRM3 sensor utilizes polarized optics for specialized detection of shiny objects. All types contain one form a relay output.